How is your business protecting itself? In today’s modern world cyber crime is fast becoming one of the most common crimes committed within the UK. With a 1 in 2 chance that a small business will experience some form of cyber security breach, it is ever prevalent that measures are put in place to ensure they are protecting themselves. By following these simple steps businesses can help save themselves from becoming susceptible to these types of threats. 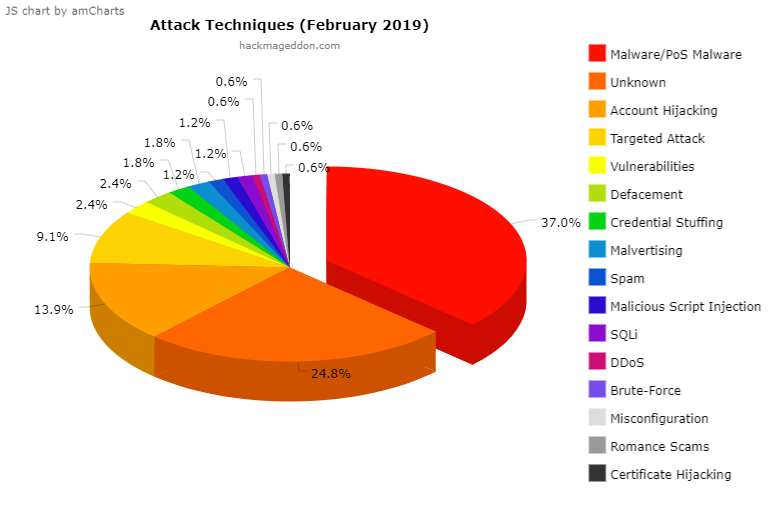 An article by Hackmageddon states that in February 88.5% of attacks were motivated by crime. As you can see from the data on different attack techniques, there are many ways for your data to become compromised. The biggest technique was through malware on devices that equated to 37% of how attacks happened in February 2019. This is a great campaign to get small businesses thinking about how they might be exposing themselves to cyber criminals. The government guide suggests these simple but effective tasks; which anyone can undertake; help businesses be proactive against any threats they may be susceptible too. Your data is basically the lifeline of your business. It contains all your vital information, customer data, supplier information, financial data and other sensitive information that is valuable to an attacker. Have you asked yourself, if you lost your data how would it affect your business? Not only in the short term but also in the long term. Malware can infect your Servers and Computers through your software or by using an unsecure website. Once they gain access to your device they can be pulling sensitive data from your system without your knowledge. Below are some of the tools and processes required to help prevent against Malware. By ensuring you are undertaking these simply processes you will be helping to safeguard your business from potential threats. You still need to have an effective IT plan and systems in place to ensure the security and safeguarding of your business. But ensuring you and your workplace are practising these tips can only strengthen yourself against these types of attacks. If you would like to read the full guide please click here. If you need information or assistance with looking after you IT infrastructure, click here to contact us on how we can help you today!